GREEN BAY — The Packers will have their second player in the NFL Network’s “Top 100 Players of 2016” revealed in Wednesday night’s episode. This player will be ranked between No. 51-60 and has made the Top 100 every year that the voting of NFL players has been compiled. The first Green Bay player revealed this year was DT Mike Daniels at No. 95. Wednesday’s new episode airs at 7 p.m. CT, with a reactions show to follow. Where will Aaron Rodgers be ranked? Packers QB Aaron Rodgers is in the top 10 of the NFL Network’s “Top 100 Players of 2015,” and his final ranking will be revealed on Wednesday night. The top 10 rankings are being unveiled in back-to-back one-hour specials at 7 p.m. and 8 p.m. CT Wednesday on NFL Network. Rodgers has been ranked No. 1 before, in 2012, following his MVP season of 2011. 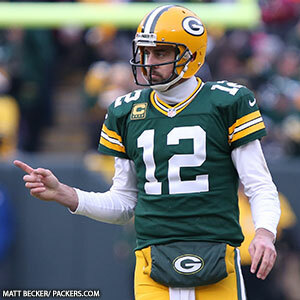 Rodgers won his second NFL MVP this past year. The rankings are determined solely by the votes of current NFL players. Rodgers will be the sixth Packers player to make this year’s Top 100, joining WR Jordy Nelson (No. 18), LB Clay Matthews (No. 51), RB Eddie Lacy (No. 60), LB Julius Peppers (No. 71) and WR Randall Cobb (No. 100). VIDEO: Which QB should be ranked highest? Another Packers player will be revealed in this week’s segment of the NFL Network’s Top 100 Players of 2015. This week’s segment airs at 8 p.m. CT on Wednesday and features the players ranked from No. 20-11. This player will be the fifth for Green Bay to make this year’s Top 100, which is determined solely by the votes of current NFL players. Thus far on the list are WR Randall Cobb (No. 100), LB Julius Peppers (No. 71), RB Eddie Lacy (No. 60) and LB Clay Matthews (No. 51). In the next episode, airing at 8 p.m. CT Wednesday, players ranked between No. 80 and 71 will be revealed, and the Packers player will be a defensive player making his fourth career appearance on the list. Earlier, Packers WR Randall Cobb was ranked No. 100. The rankings are based solely on votes cast by current NFL players. UPDATE: LB Julius Peppers makes list at No. 71. Click here to watch the video. GREEN BAY — The NFL Network’s annual “Top 100 Players” series returns on Wednesday at 8 p.m. CT, and a Packers player will be revealed on the first episode, between No. 100 and No. 91. According to information from NFL Network, the Packers player to be revealed on Wednesday night is an offensive player who has not made the Top 100 list in the past. The list is determined solely by the votes of current NFL players. UPDATE: WR Randall Cobb placed No. 100 on this list. Click here for video. A Packers player will be revealed on NFL Network’s Top 100 players of 2014 between Nos. 80 and 71 on Wednesday’s show at 8 p.m. CT. This will be the third Packers player to be revealed on the list so far. Eddie Lacy at No. 90 and Jordy Nelson at No. 83 were featured last week. The list is determined solely by a vote of current NFL players. Update: The player is LB Clay Matthews at No. 77. The NFL Network’s “Top 100 Players of 2014” series will reveal two Packers players ranked between No. 90 and No. 81 in a show that airs at 8 p.m. CT Wednesday. That will be followed by a reaction show at 9 p.m. CT. The list is based on a vote of NFL players. Update: Those two players were RB Eddie Lacy at No. 90 and WR Jordy Nelson at No. 83. 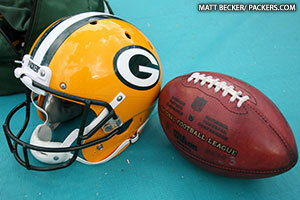 The NFL Network’s “Top 100 Players of 2013” is down to the top 40, and a Packers player will be profiled in the Nos. 40-31 segment scheduled to air at 7 p.m. CT on Thursday. That player’s name and his ranking will be revealed during the show. Through the first 60 players, so far only one player who played for the Packers last season has been profiled. DB Charles Woodson, who played for Green Bay from 2006-12 and recently signed as a free agent with Oakland, was ranked No. 85. The weekly series will continue each Thursday until only the top 10 remain. Back-to-back episodes at 7 p.m. and 8 p.m. CT on June 27 will profile the top 10 players. Update: The Packers player profiled on Thursday was LB Clay Matthews, who was ranked No. 31. To see the video of his profile, click here. NFL Network has brought back its annual Top 100 Players series for 2013, and a Packers player will be profiled in the segment slated for 7 p.m. CT Thursday, which will reveal players ranked No. 90 through 81. The Top 100 series kicked off on last weekend with players No. 100 through 91. No Green Bay players have yet been profiled. The 11-episode, weekly series continues each Thursday at 7 p.m. CT, unveiling 10 players at a time until the top 10 are revealed on June 27. Update: The player in Thursday’s segment was Charles Woodson, ranked No. 85.